Incorporating fun physical outdoor games and indoor classroom exercises are great ways for teachers to encourage students to establish healthy habits. The National Health Education Standards & Common Core State Standards aim to support a whole-child approach to education-one that that ensures that each student is healthy, safe, engaged, supported, and challenged in their learning. Here are a few tips for establishing healthy habits in the classroom. 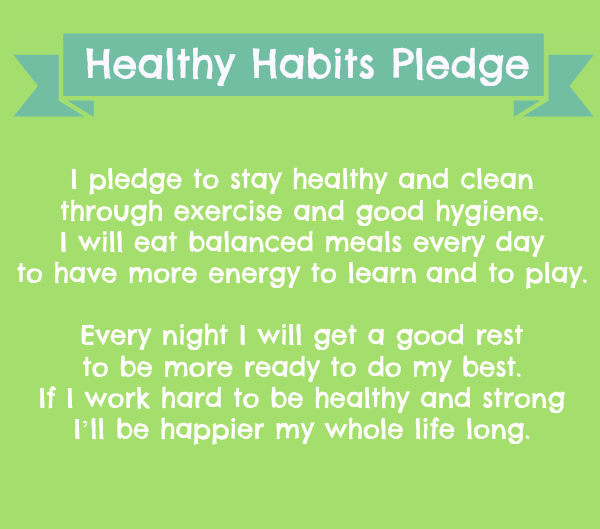 Share the Healthy Habits Pledge above with students and discuss each line. Challenge students to learn the pledge and share it with family members. The goal here is to inspire the whole family to focus on good nutrition and support healthy habits. Post the pledge in the classroom and review it from time to time as students gain more insights into personal health. Introduce daily exercise to your students. Use physical activities to start the day and/or to transition from one activity to another. Throw in an extra exercise on tough days, or use more than one when weather conditions inhibit outdoor activity. These short, physical exercise breaks are a positive way to settle students for their day’s work. And don’t forget breathing exercises! They can be done at any time of day and can help refocus or calm students as needed. Gather and display reference materials for the classroom on topics of nutrition, fitness, and overall health. Resources might include library or trade books, magazines, posters, and kid-friendly materials printed from government websites. If appropriate, save links to relevant websites in a dedicated folder on classroom computers. Encourage students to start collecting packaging and nutritional labels from food products. Explain that they will be learning to read them and using them for comparisons. Establish an area in the classroom where these can be stores or displayed. For free sample pages, classroom exercises, and ideas see Healthy Habits for Healthy Kids.